1996 - 2000. What's Old in Wollumbin? Travel updates to accommodation and tours around Byron Bay, Tweed Valley, NSW, Gold Coast, QLD, Australia. 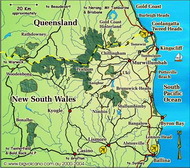 Far north coast, Northern Rivers NSW. Updated Durobby Retreat. If you are looking for a romantic break, a health retreat, or just the chance to slow down in stunning natural surroundings, please join us at a place in harmony with its environment, so you too, can experience more than just our five star accomodation and service. Amigos is a small and beautiful budget beach house, just 7 minutes walk from one of the world's most beautiful beaches and Byron's lively cafe, restaurant and shopping scene. A relaxed home away from home. Midginbil Hill Country Resort site has been completely updated. A farmstay with guesthouse style facilities and campground, adjacent to a World Heritage listed national park; with swimming pool, tennis court, canoeing, horse riding, birdwatching, bushwalking and archery available, or participate in rainforest replanting and echidna monitoring programs. B&B and holiday packages available, and personalised quotes for groups of 10 or more. Self cater or have bed and breakfast at Torokina, a delightful and private 3 bedroom fully restored colonial cottage, atop a hill overlooking sugar cane fields, in the heart of the beautiful Tweed Valley. The perfect base for a relaxing holiday or weekend escape, you can unwind in the privacy of the cottage and surrounds, or take advantage of the region's many attractions. More relaxed than a B&B, more private than a motel, Byron Bay Rainforest Resort Guest House with swimming pool, is on 5 acres of rainforest and only 3km from down town Byron with all it's action, nightlife, shops, restaurants and cultural events. Cheerful and spacious accommodation for those on a budget. Tweed River "Catch - A - Crab" Tour, provides a unique and unforgettable experience. Enjoy pelican feeding, yabbie pumping and fishing followed by a scrumptious full Queensland crab lunch. Nature cruises and oyster farm tours also available. The Tea House Limpinwood updated. Ideal for lunch, morning and afternoon teas on your scenic drive Friday to Sunday. The Teahouse is also a spectacular location for weddings, special ocassions and coach tours. Planula B&B is the first accommodation in Byron Bay to cater to scuba divers, with expert hosts, an extensive library and lock-up facilities for scuba equipment. Whether it's your first dive or your 100th, Planula is a home away from home for couples and groups who enjoy this exhilarating activity. Belongil Beach River House is a river front home ideal for a family or group looking for a Byron Bay rental. Whole of house or separate self contained studio available. Stroll to Belongil Beach 2 minutes away or walk from your verandah down to Belongil Creek. Caring Views B&B is a country guesthouse with a difference. Less than 15 minutes drive to Byron Bay, Brunswick Heads and Mullumbimby, your host Elisabeth provides a retreat where the focus is on health and relaxation, with fine organic meals, special dietary requirements and in-house massage available. German, French and Japanese also spoken. Cottages on the Creek web site updated. Memorable honeymoons, romantic breaks and weekend getaways at Cottages deluxe eco friendly cabins. Read the raves from guests and then book your special break. Updated rates for Eagle Harley Tours, which offers Harley Davidson Motorcycle Day Tours and rentals for individuals, groups and corporate events on the Gold Coast and beyond. Nelly's Manor a la carte restaurant hosts regular events including Literary, Murder Mystery and Trivia Nights. Midweek getaways, relaxation, romance and seclusion in the Byron Bay - Gold Coast region of NSW and QLD, for couples only. Beachfarm site completely updated and moved to domain! A unique working tropical fruit farm offering accommodation and tour packages to suit individuals, couples and groups. Choose from horse riding packages, 1/2 and full day group tours, agri-tours, international student programs, primary school camps and senior citizens group tours. Tea House Limpinwood is famous for "Theatre under the stars". You won't want to miss "At The CrossRoads", a New Season by Women on a Shoestring !! A musical meeting extraordinaire is held at a crossroads in the middle of nowhere, to elect a new president of many organisations after the sad passing of Beryl in mysterious circumstances. Saturday 12 August 7pm; $16.00 Adults, $14.00 conc., and $14.00 buffet dinner. Byron Bay finally has a "legal" Clothing Optional Beach ... 3 glorious kilometres of clean, uncrowded white sand, clear unpolluted seas and great surf. A report by Peter Bentley of Sense Adventures. Updated Olympics/September School Holidays and post Olympic accommodation, tours and activities vacancies in the Byron Bay - Gold Coast region of NSW and QLD. Less than 15 minutes drive from Murwillumbah, two Magnificent properties provide you with the opportunity to own acreage in the Tweed Valley. Whether you are seeking a peaceful rural rainforest retreat, or are looking for an income producing opportunity, these Crystal Creek properties should be on your "must consider" list. New category, Real Estate Guide, is a directory of properties for sale and lease, including farms and acreage, in the Tweed Valley and coastal hinterlands of northern NSW and SE QLD. Just 5 minutes drive from Palm Beach on the Gold Coast, perfect for couples and families looking for an active holiday, Tally Park Farmstay has a variety of facilities and activities, including swimming pool and spa, tennis court, 6 hole golf course, one kilometre walking and running track, and horse riding. Updated Hanging Rock Chalets. Self cater in our self contained cottages, or choose from the eateries and restaurants on the Gold Coast. Ideal for a midweek or weekend getaway! Olympics/September School Holidays and post Olympic accommodation, tours and activities vacancies in the Byron Bay - Gold Coast region of NSW and QLD. But be quick! Peace, privacy, spectacular views from Mt Warning to the Border Ranges, heated pool and jolly good food at Hillcrest Bed and Breakfast. Nelly's Manor is a spacious luxury B&B, just 8 minutes from Pottsville Beach, perfect for those seeking total seclusion, privacy and relaxation, and for corporate retreats. At Inter-Action Experiential Learning Pty Ltd, our aim is to facilitate growth in individuals and groups by building healthy and dynamic human relationships using a combination of challenge, adventure, fun and reflection. EcOasis. Nestled in the lush Tweed Valley, secluded architect-designed studios feature extensive use of timber and glass. Enjoy private verandahs, gourmet kitchens and a truly contemporary style. Spectacular views of Mt. Warning, national parks and an abundance of wildlife at your front door. Nature in absolute luxury. Various accommodation and activities directories listings updated. Queens Birthday June long weekend vacancies and North Star Holiday Resort updated. New look and updates for Durobby Retreat, Lodon Lodge, Foxy's Country Resort and Golf Course. Easter Vacancies. Still looking for a place to stay at Easter? Here are some of the fine accommodation in the region which still have cabins or rooms available. But be quick! Updates to Apartments, Townhouses and Villas, Backpacker Accommodation, Guest Houses & Lodges, Health Spas & Relaxation Retreats, Holiday Houses, Flats & Bungalows, and Studio Apartments and Self Catering Units. Cocktails with Noel and Gertie, presented by Top Hat Productions adapted from the works of Noel Coward and Gertrude Lawrence. An open air production highlighting the collaboration between Noel Coward and Gertrude Lawrence. One evening performance on 8 April 2000 in the bush garden setting of the Limpinwood Amphitheatre. Updated various Retail & Services and Attractions & Activities. Situated on the Tweed Coast just metres from the Pacific Ocean, North Star Holiday Resort is the first NRMA rated 5 star caravan park in NSW and one of only 7 in Australia. Choose from an excellent range of accommodation, including caravan and camping sites, cabins, chalets, holiday homes and luxury apartments. The main attraction of the Ballina Navel & Maritime Museum is the La Balsas raft, one of three that made the epic journey from Ecuador to Australia in 1973. A large collection of naval and maritime memorabilia including a replica naval mess deck, 21 inch torpedo, mannequins in dress uniforms, model ships, hundreds of photographs and paintings, plus interesting items like ballast from the H.M.S bark Endeavour and decking from the Krait, used in the WWII operation Jaywick, are also on display. Hire a car or trailer in the Tweed Valley with MacLeod's Auto Centre. Kingscliff Beachcamp day excursions, school camps and outdoor education programs. Set your own program, or let us help customize one for you. 4 Star waterfront holiday units at Sunrise Cove Holiday Apartments with friendly, professional onsite managers, gives you the best of both worlds. The beach and Kingscliff village a leisurely stroll away, and it's less than 20 minutes drive to World Heritage national parks and the Gold Coast. Featured in Australian Geographic's Gardeners Journal 1999, Mother Natures Bush Tucker offers educational seminars and workshops, tours and field trips; bushfood plant supplies, and design services for the establishment and use of indigenous edible landscapes. Dare to be different! Eagle Harley Tours offers Harley Davidson motorcycle day tours and rentals for individuals, groups and corporate events on the Gold Coast and beyond. Just 300 metres from the sparkling clear waters and white sand beaches of the Pacific Ocean, Byron Bay Rainforest Resort is a peaceful retreat where you can escape to relax and revitalize. Mobility impaired travellers welcome. An ideal base to explore the outdoor attractions and wwoofing in the region, Lismore Backpackers provides clean, comfortable accommodation close to the CBD, Southern Cross University and hospitals. Families, school and sporting groups welcome. Updated Retails and Services directory. Have a funtastic time learning to ride the waves in Byron Bay, doing dolphin and (seasonal) whale watching, and help dolphin research at the same time, with Dolphin Kayaking. Updated Bushranger Country Hideaway. With full resort facilities and a variety of activities also available, the Bushranger entices worn and weary city escapees to draw a breath of rejuvenating country air. Millennium Celebrations updated, Day Tours and Cruises, 4WD and Adventure Tours, Ecotours and Nature Tours, Education and Research, various accommodation and Retail and Services updated. Updated Mountain Trek Adventures ; Discover the Gold Coast and Hinterland by four wheel drive (4WD). Visit World Heritage listed Lamington National Park, O'Reilly's Guesthouse and the unique village delights of Tamborine Mountain. Updated Pottsville Beach Motel, under new management; Come for the night and stay for the seafood! Clean and spacious double, family and group accommodation, B&B, self cater and licensed restaurant. Updated Midginbil Hill Country Resort; 1999 Northwards Award, 1999 New South Wales State Tourism Award Winner, Advanced Ecotourism Accreditation. Established 25 years, Midginbil Hill has full facilities and activities on-site. Participate in all the activities on offer, or just relax and let us do all the work for you! Self cater or bed and breakfast at Torokina Cottage, a delightful and private 3 bedroom fully restored colonial cottage, atop a hill overlooking sugar cane fields, in the heart of the beautiful Tweed Valley. Updated Tweed Adventure Cruises, Millennium New Year 1999 celebrations, and Macas Camping Ground. Directory listings updated in various accommodations, Day Tours and Cruises, Adventure, Eco and Nature Tours, Art Galleries, Artisans and Crafts, and Events, Festivals and Shows. Kookaburras Realm provides secluded non smoking B&B bed and breakfast studio apartments set in rainforest, with spectacular world heritage views. Various Activities updated, including Art Galleries, Artisans and Crafts, and accommodations updated including B&B, Motels, and Hotels, Motor Inns updated. Tweed Valley Travel Centre has more than 20 years service arranging holidays around Australia and around the world with expert, efficient and friendly service for locals and international visitors. Providing a range of all inclusive Escape packages, ideal for a honeymoon, romantic break or relaxing getaway, Foxy's Country Resort now has an exquisite wedding chapel and reception centre as well. Various accommodations updated. Conference and Function centres updated and Events, Meetings and Weddings Services added. Memorable honeymoons, romantic breaks and weekend getaways at Cottages on the Creek deluxe eco friendly cabins, in the hinterland, just 15 minutes to Gold Coast beaches and Tweed clubs. Just 300 metres from the sparkling clear waters and white sand beaches of the Pacific Ocean, Byron Bay Rainforest Resort is a peaceful retreat where you can escape to relax and revitalize. Frank Theatre returns to Wollumbin for their third season at the Limpinwood Amphitheatre. In October we will be treated to a colourful and musical production of Salome, by Oscar Wilde. You'd be mad to miss it! Tweed Arts Network Inc. A new front page (under construction), along with November 1998 and June 1999 issues of the Networker, membership application, nomination and proxy forms. Outdoor Education in the Tweed Valley Adventure, fun, challenges, healthy risk taking, and quiet reflection are ... offered to schools and tertiary students participating in core components of the education curriculum, the Outdoor Education Curriculum. Ecotourism Resource Centre research, papers and articles, Community and Volunteer Tourism, Codes of Practice, and Associations & Societies links updated. Foxy's Country Resort & Golf Course is an intimate all inclusive resort accommodating a maximum of 14 people. Choose a Country Guest Room, Country Suite, or our luxurious and private Honeymoon Spa Suite. B&B, Camping Grounds, Caravan Parks, Golf Clubs & Courses, and Conference & Function Centres updated. Hanging Rock Chalets updated to include B&B accommodation and short breaks packages. Wake up to the sounds of whip birds and kookaburras as the morning mists rise over the rainforests. End the day with a sundowner as you listen to the cicadas evening chorus accompanying magic sunsets. Established in 1988 and covering eight hectares, the Tweed Heads Historic Site preserves an Aboriginal Bora Ground, with a walking track leading to a mangrove boardwalk along the Tweed River. The Minjungbal Aboriginal Cultural Centre with Aboriginal museum and gift shop is open seven days a week, with a nominal admission fee for adults and children. Mount Warning National Park description updated. Accommodation Category for School Camp, Student and Outdoor Education Centres. Other accommodation categories revamped or updated, include Apartments, Backpackers, Bunkhouses and Dormitories, Guest Houses, Motels and Resorts. The Tea House Limpinwood updated. Major update to Beach Farm, now providing Farmers Technical and Agri-tours, Australian Schools Outdoor Education Programs and International Student Programs. Major updates to European Discovery, The First Australians and Australian Whaling History. Heavy Metal Hamlet: Having already received rave reviews at the Brisbane Festival last year, Frank Productions and the Teahouse - Limpinwood present this year's stunning adaptation of Shakspeare's Hamlet. Climbing Mount Warning in the World Heritage Central Eastern Rainforests (CERRA) of Australia sometimes results in unexpected rewards. Local enthusiast, Stuart O'Neill, guides us to the top. Complete revamp and updating of some information in the natural attractions section of the site, to incorporate institutional partnership of the UNESCO World Heritage Information Network. Updates to Sunrise Cove Holiday Apartments, Byron Bayside Motel and Murwillumbah Motor Inn. Spring of 1998 has been a great year for Osprey Breeding Observations and for fledging of Ospreys on the Tweed River estuary and the Tweed Coast. National Parks and Wildlife Service officers rescued a pair of chicks from serious difficulties during a banding program. You can Relax in Comfort at Byron Bayside Motel Self Contained Studio Apartments when you stay in Byron. A comfortable 200 metre stroll to Main Beach, the nightlife, shopping and eateries of Byron Bay, this recently built motel complex is just 150 metres from the train and coach/bus stations. Never Never Safaris One of the original day tour operators to the World Heritage listed Border Ranges National Park and beyond, Never Never now also has a range of extended tours and safaris to the Great Barrier Reef and Outback Australia. Feature Story; Tweed Farms Interest Japanese: SPECIAL interest tourism is the best kind of tourism according to local business operator, Helen Taylor. The Networker is the newsletter of TAN, the Tweed Arts Network. This is a community based arts organisation constituted to "recognise, encourage and promote the diversity of the cultural life evident throughout the Tweed Shire". The Big Volcano is sponsoring their web pages which will appear over the next few months. This issue of The Networker includes an online database/membership form and an invitation to a picnic barbeque! Pottsville Beach Motel caters for families and groups looking for a personal touch. Friendly service and personal attention for weary travellers. Affordable overnight and weekly rates, with specials for couples and groups. Get a very different view of the Tweed Valley, lowland rainforests and birdwatching on a jungle eco cruise with Tweed Adventure Cruises. Private charters for just about any purpose or occasion also available. The Site Map has been completely overhauled, with "at a glance" access to most pages on Big Volcano. World Heritage of the Wollumbin Volcano has been updated with the addition of Rainforest Types of the region. Lismore Backpackers is ideal for exploring the outdoor attractions and wwoofing in the region, located in a leafy, quiet street, providing clean, comfortable accommodation close to the CBD, Southern Cross University and hospitals. Located ½ way between Lismore and Nimbin, Klassic Lodge is a modern fully licensed motel set on 20 landscaped acres. Specializing in coach and group tours, it is perfect for an overnight stop or extended stay. Just 30 minutes to Byron Bay Macas Camping Ground on 500 glorious acres of remnant and regenerating rainforest, is a great "off the beaten track" alternative to the usual places to stay, if you're looking for a quiet and tranquil base to explore the region's attractions. Wollumbin Visitor Guide extensively updated for easier navigation, and a comprehensive Activities and Attractions Directory added. Volunteer and Community Tourism links added to the Ecotourism Resource Centre. Bushranger Country Hideaway is an intimate, comfortable Country Inn, offering Bed and Breakfast, and numerous outdoor activities in a country resort atmosphere. Located in the heart of Surfers Paradise on the Gold Coast, Eagle Harley Tours offers Harley-Davidson Motorcycle Tours and Rentals for individuals, groups and corporate events. Go on ... DARE you! Tours and Cruises updated with new listings. Friday, 2 October 1998: Sunrise Cove Holiday Apartments and Lodon Lodge updated, please visit! 20 September 1998: Updated Cabins, Cottages and Chalets, and Bed and Breakfast accommodation listings. 15 September 1998: Beach Farm Farmstay and Tours is a unique working tropical fruit farm offering clean and comfy self catering and catered accommodation to suit backpackers, families, school and educational groups. 7 September 1998: Enjoy a Gold Coast getaway in the Hinterland rainforest at Hanging Rock Chalets. Extensive views of the Pacific Ocean and World Heritage Rainforests, yet only minutes to the Gold Coast beaches. Accommodation Package Tours, Bed and Breakfast, Bunkhouses and Dormitories, Studio Apartments and Self Catering Units, Holiday Flats and Bungalows, Cabins, Farmstay, Group Accommodation, and Retreats accommodation listings updated. Day Tours and Cruises, 4WD and Eco Tours updated. 27 August 1998: Stay in 5 star luxury cabins at Durobby Retreat in a unique lakeside setting adjacent to the World Heritage listed Mount Warning National Park. Bed and Breakfast, Boutique, Cabins, Health Retreats,and Retreats accommodation listings updated. 23 August 1998: For lovers of music and nature, the Tyalgum Festival of Classical Music is the best of both worlds. Nestled in the foothills of Mt Warning, 24 Km west of Murwillumbah, Tyalgum is a picturesque rural village and host to one of Australia's best classical music festivals. 16 August 1998: A Tweed River Houseboat is the perfect way to escape the pressures of the world for a truly relaxing holiday. Whether there's only two of you, or you're a family or group, this is a fun and different holiday! 16 July 1998: Starbase 6 - Hideaway in the Stars is unique accommodation on two accounts. Two railway carriages have been converted into modern comfortable bedrooms. They represent the warp nacelles of a mighty starship! The bridge of the ship is a huge octagonal room comprising the living and dining areas. From high on top of a hill, the view from the bridge is huge too, overlooking the incredible Wollumbin Caldera. 14 July 1998: Byron Bay Dreamtime Journey Aboriginal Cultural Tours is a fun and relaxed journey into Australia's original culture. Incorporating Dreamtime Journey Art Gallery and Crafts, choose authentic indigenous arts and crafts from NSW, QLD and the NT. You can even learn how to make or play a didjeridoo! Whether it's a 1/2 day, full day or extended tour you want, let Trailseeker Tours and Travel Services customise an itinerary for you. Specializing in soft adventure, ecotour and educational holiday packages for individuals and groups. Bed and Breakfast, Motels and Retreats accommodation free listings updated. 29 June 1998: Bed and Breakfast, Motels and Retreats updated. 25 June 1998: Secluded luxury rainforest lodges await those who long for a uniquely different honeymoon or romantic break at Wollumbin Palms Retreat. 21 June 1998: New editorial on Australian Whaling History, arts and crafts, National Parks, State Forests and Reserves. Updated Golf Clubs, natural attractions listings. 16 June 1998: Mountain Trek Adventures are the original and most experienced four wheel drive 4WD day tour operator to the world heritage listed national parks in the Gold Coast hinterland. 1 June 1998: Retreat to a Breath of Fresh Air at Midginbil Hill Country Resort. Holiday packages and weekend escapes for couples and families on a farmstay with guesthouse style facilities adjacent to a World Heritage listed national park. 15 May 1998: "Sofcom are delighted to inform you that your web site - Big Volcano - has been chosen as one of the very best sites in Australia, and we would like to award you with a Sofcom 'Pick of the Net' award." 5 May 1998: Accommodations updated in a number of categories. 22 April 1998: Gunnebah Retreat is an ideal venue for health, wellbeing and alternative therapists and group leaders to conduct conferences, seminars and training workshops, in a secluded and tranquil environment. Also casual Bed and Breakfast accommodation. The Permaculture Research Institute offers extensive courses in Permaculture and guided tours of "Tagari Farm", a working permaculture farm. Learn how to create a self-sustaining environment in any situation, with Permaculture. 21 March 1998: Visit Mother Nature's Bush Tucker and Wildlife Refuge, native plant forest and edible rainforest to see for yourself and experience the fascinating world of Australian native bush food. Also enjoy an extensive Wildlife Art Gallery featuring Brian Boyd's native timber sculptures. 11 March 1998: Let Pottsville Beach Motel give you the base for exploring northern NSW's beautiful coastline and rainforests - you won't be disappointed. Providing clean, spacious and modern rooms, with generous facilities and additional services for guests, Stuart and Melanies' motto is "Service with a Smile - Guaranteed". With 31 modern, well appointed 3 to 3½ star units, at Murwillumbah Motor Inn we strive to provide every guest with comfortable, quiet, high quality accommodation to meet your needs. Corporate travellers and members of motoring associations welcome. At Blue Waters Motel in Kingscliff, your friendly and professional hosts Jan and Tom Kelly, understand the needs of touring visitors and business travellers. Choose from self contained units, Bed and Breakfast and motel rooms in 3 star comfort. Come to your senses with Sense Adventures at Maya - The Treehouse, a wilderness retreat with all the modern comforts. Involved in Environmental, Special Interest, Adventure, Cultural and Alternative travel since 1968. Camp under the southern cross when you visit World Heritage forests in our finest national parks. Up to 3 day ecotour adventures; trek in typical Aussie habitats and help in research and regeneration projects with Dr Ronda Green of Araucaria Ecotours as your guide. With stunning views overlooking the Limpinwood Valley, Tea House Limpinwood serves morning and afternoon teas made from locally grown, fresh and organic foods, from 10am to 4pm Friday, Saturday and Sunday. Overnight Farmstay Accommodation is also available. The Teahouse, Limpinwood presents Bard in the Bush. Brisbane's Frank Theatre production of The Tale of Macbeth: Crown of Blood, an intriguing open air adaptation of Shakespeare's Macbeth. Three evening performances in May in the bush garden setting of the Limpinwood Amphitheatre. Big Volcano Visitor Directory - Supporters page added. Convenient links directly to our supporters. 24 January 1998: Accommodation ranging from luxury cabins and ensuite cabanas to powered caravan, RV trailer and tent sites at Drifters Van Village, nestled on 10 acres of landscaped gardens between the Pacific Ocean and the Tweed River. Just 10 minutes to Coolangatta airport and conveniently placed to the Pacific Highway and public transport. Ideal for boating enthusiasts. Hidden in the Byron Bay hinterland is Macas Camping Ground. On 500 acres of rainforest and macadamia plantation, Macas is just 30 minutes to Byron Bay and a short drive to Mullumbimby. From Byron Bayside Motel you can stroll to Main Beach, the nightlife, shopping and eateries of Byron Bay. Self contained studio apartments, just 150 metres from the centre of town, train and coach stations. Singles, families and travellers welcome. Sunrise Cove Holiday Apartments with friendly, professional onsite managers, gives you the best of both worlds. With a stunning Cudgen Estuary absolute water frontage, the beach and Kingscliff village are a leisurely stroll away, and it's less than 20 minutes drive to World Heritage national parks and the Gold Coast. Feature Story; CALDERA TRACK PROPOSAL GAINS IMPETUS. Widely beleived to have potential equal to the great walking tracks of the world, the Wollumbin Caldera region of Australia continues to suffer from lack of funding. Local Member of Parliament for Richmond, Larry Anthony, discusses the issues which need to be addressed if the vision is to become a reality. Award winning Lodon Lodge offers Bed and Breakfast (BnB) Farmstay accommodation on a working beef cattle property complete with subtropical rainforest stands, adjacent to the World Heritage listed Lamington and Border Ranges National Parks. Durobby Retreat is a five star luxury nature retreat on 100 acres. Stay in luxurious cabins in a unique lakeside setting adjacent to the World Heritage listed Mount Warning National Park. A Tweed River Houseboat is the perfect way to get away from it all, to unwind and relax. Treat yourself to a great escape holiday on the picturesque and peaceful Tweed River on your next vacation. 28 September 97: Receive the webs' longest running and original award, the Lycos Top 5% Award for the Ecotourism Resource Centre. September 97: As well as this page, you can visit a new Fast Facts page, a new Feature Story on Murwillumbah, updated Sport and Recreation pages for Golf Clubs and Courses in the Tweed Valley, and you can also learn a little about who Big Volcano is. Also finally got our Link Exchange link working! Plus all the usual offline stuff. July 97: Domain name now active, site submitted to search engines and directories. Compliments and requests for links starting to arrive. ERC updated again. June 97: Beta site uploaded to server. Request colleagues to visit Beta site to test and provide feedback. ERC updated again. May 97: Email compliments starting to arrive regarding ERC. Beta testing of Wollumbin Visitor Guide on local computer. April 97: Ecotourism Resource Centre uploaded to Geocities, and submitted to major search engines. January 97: Start designing Ecotourism Resource Centre (ERC), and writing tourism editorial for Wollumbin Visitor Directory. February 96: At last! Local call dial-up access to the Internet. Serious surfing to research tourism opportunities on the WWW begins.